What makes the fuel pump stop after about one second if the car key is placed in position II, but not started? 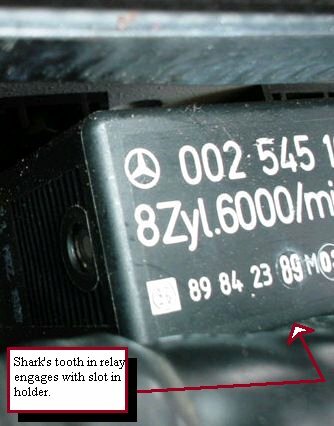 Is it part of the relay, is it part of the "fuel injection computer" or is there a sensor that tells the relay that the engine is not running? My car ('87 420 SEL, W126) has this problem since the transmission front pump seal was replaced (or since I replaced the fuel pumps, filter etc., which was basically finished the day before I brought the car to the dealer for the transmission). I am about to buy a new relay but would just be sure that it is really the relay and not some sensor or a loose connection to a sensor. The dealer told me his transmission work is fine and has nothing to do with the fuel pump relay. Thanks for your help, it is appreciated. It is nomal for the FP relsy to dropout if the engine is not running. This is a safty feature. What kind of problem do you have? it is the opposite with mine. The pump keeps on running rather than shutting off after a second or so. I try to find out what makes it stop as that part is not working. 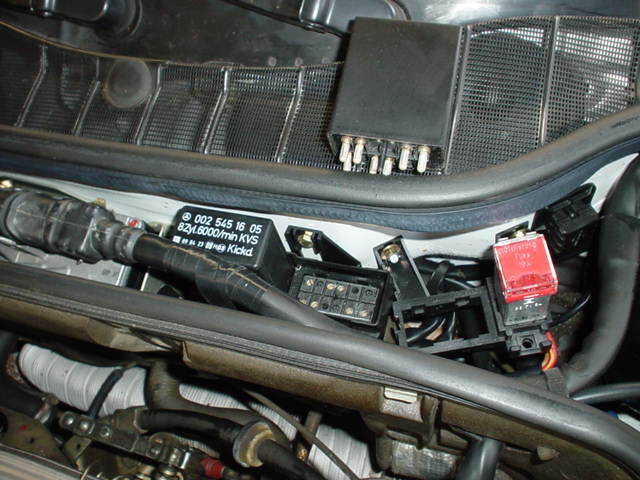 If the fuel pump relay itself makes it stop, then the replacement of the relay will take care of it. I just don't want to replace the relay and then still have the problem. I also don't feel good driving the car with something obviously wrong and I might get stranded. It is a pulseing signal from the Ignition module that makes and keeps the FP relay energized. 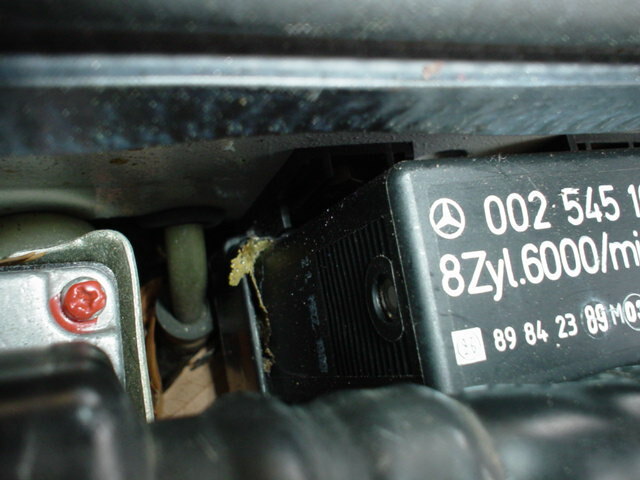 Disconnect the plugs/conectors from the ignition module and see if the pumps stop. If not, and I don't think it will, remove the FP relay and make sure they stop. If they do, probably the relay is bad. If not, there is a short somewhere. Look at the FP relay socket and make sure someone didn't put a jumper wire in to make the pumps stay on. I also received an e-mail pointing out that the sensor at the flywheel feeds the ignition control module with info that is than passed to the fuel pump relay as you describe. Now I need to find the ignition module. Unfortunately, FastLane's parts catalogue online didn't have a picture of it but I give it a try later this morning. does the fuel pump relay come right out on a W126 '87 420 SEL by being pulled straight up or is there a catch somewhere on the passenger side? The AC relay next to it came right out. I don't want to pull too hard and brake something. Your help is appreciated. .... is retained by a couple of tabs on the socket in the middle of the long side of the relay. They are like backwards pointing shark's teeth. You can overcome these by rocking the relay to and fro (in the direction the car points) while pulling up. If that doesn't work, try inserting a thin steel rule, its flat side in contact with the relay's body, vertically in to the socket and prying gently as you rock the relay. That should free the one side and then the other will give. The relay has a white stamp on the side saying 21 March 89!!! Now after I saw that, I simply said: It's time for a new relay, this one did it's part. I looked into the base of the connector and noticed something like a needle from a christmas tree and some dirt. So out with the Q-tips and some dielectric grease to clean up the base and to lube the connectors of this relay and the AC relay next to it. I also cleaned the sides with the teeth and put some wax on it to make it come out a little easier the next time. Then to make sure the car will start, I turn the key and just wait a bit at the position II. Sure enough, the pumps start and stop after about a second. As these new ones are a lot quieter than the old ones, I even get out of the car to listen to the "silence"!!! I can't believe my luck. A little grease and cleaning and the thing works again. I tested it a few more times, even with my neighbor listening and it works ...Couldn't all problems end this way? Ign mod is in the left front (drivers side)of the engine bay. From memory, I believe it is a box about 4X5 in with 2 or 3 round plugs on it. 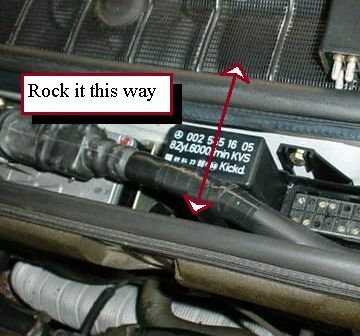 If you want to make sure it is not causing the problem, just unplug all the plugs and turn on the ignition switch. If the fuel pumps still run, then the ign mod is not the problem. If the above doesn't help find it, let me know and I will take a picture of one and send it. Well, I just read your post that everything is working now. Great. Sometimes on these old cars, just a little TLC works wonders. The problem with these relays seems to be that they develop bad solder joints from all that vibration over the years, so don't be too surprised if yours starts to misbehave again. I keep a jumper wire in the car to short sockets 7 and 8 as we discussed previously, just in case. BTW, I tried the resoldering trick on my 560SEL fuel pump relay and had no luck.